In addition to offering all the features of the software, the High-level extension was designed in close collaboration with the National Sport Institute of Quebec, which supervises athletes at the Olympic and Paralympic levels by providing them with integrated services worthy of the world's best practices. Always built around a collaboration, this extension allows you to reach very advanced levels of analysis. Proud to always promote your working method, the software is customizable according to your needs. Integrate your calculations and the software will keep the value up to date. All training workload calculations are already integrated in the software.Calculate the workload of your athletes using the '' Acute: Chronic Workload Ratio '' measure. Then analyze it’s evolution with complete and varied graphics. Exponentially weighted moving average (EWMA) calculations are built into the software and allow you to track training load evolution. In the interest of flexibility, the software perfectly integrates the R language, a mathematical programming language supported by a huge community. This integration makes it possible to calculate absolutely any data, no matter how complex they may be. From the perspective that the creator no longer allows you to do what you want, you can create graphs using the R language. We will display the result of your code directly. Leave Excel aside and use the high-level extension to process your data directly in Hexfit. To greatly simplify the collection of valuable data from your clients and athletes, schedule the automatic sending of questionnaires. So, let your customers fill out these forms as often as you want, without any intervention on your part. The software then records and organizes all the information collected before you put into operation the many analysis tools. Ask the Querybuilder exactly what information you are looking for and let this powerful tool show you all the data you need to learn from it. Filter and group your data to find exactly what you are looking for. All this without having to write a line of code. Thus, the possibilities are endless in terms of export and analysis of the collected data. Developed in partnership with you! The performance extension is described by a close collaboration between Hexfit and organizations looking for powerful tools. 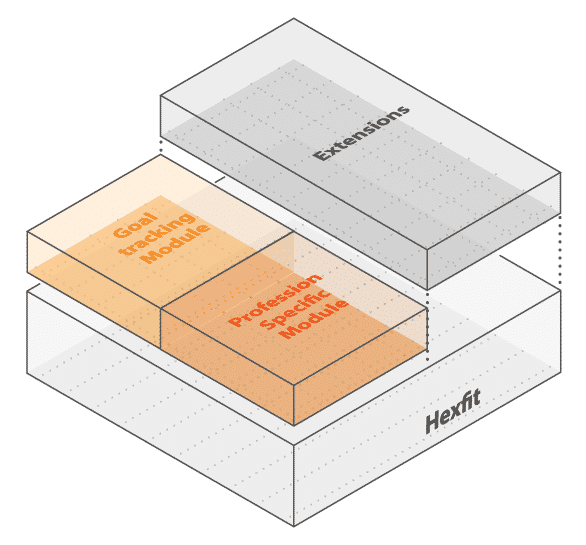 With this expansion, Hexfit is at the heart of the technological developments needed to make the most of the flexible features of the software. Our software adapts to the specific needs of your organization in order to optimize the achievement your athletes’ objectives.